The Connecting Council discussed ways to measure congregational vitality, the consolidation of the three Great Plains Conference offices and the response to calls for relief for hurricane victims as part of the council’s annual fall meetings. 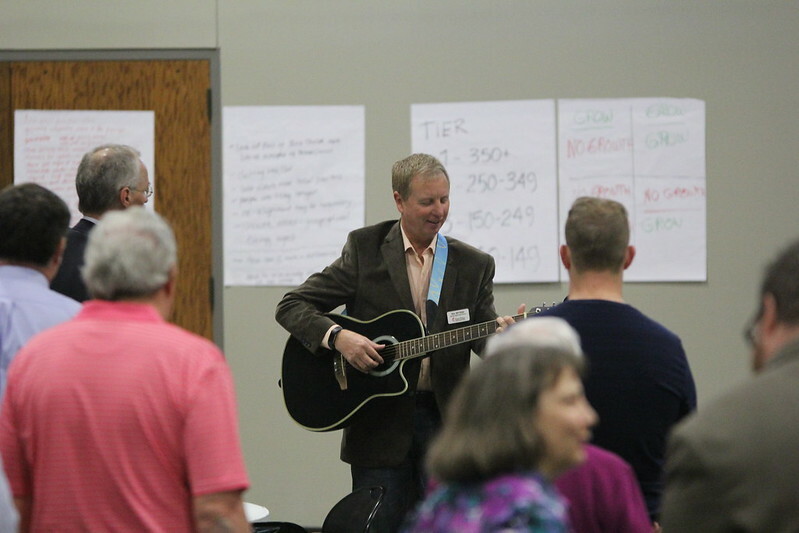 The group of 65 people – pastors and laity who serve as the decision-making body of the Great Plains Conference between annual conference sessions – met Oct. 20-21 at Trinity United Methodist Church in Salina, Kansas. Bishop Ruben Saenz Jr. opened the meeting with a time of presentations and then follow-up table discussions about a pathway to missional vitality. Participants reviewed a report on the Great Plains Conference drafted by the Lewis Center for Church Leadership. The report shared statistical trends for the conference’s large, mid-size and small churches. It also examined clergy trends by deployment and age, broke churches into strategic matrixes and identified key churches for growth. Relentlessly focus on areas of population growth. Focus on professions of faith and community engagement. Increase the number of churches that have at least 100 people in worship each week. Prioritize issues faced by small-membership churches. Work to find ways to take financial pressure off congregations. Bishop Saenz said the report’s recommendations fit well with the conference’s emphasis in the past year to focus heavily on each church’s mission field. After the bishop presented his thoughts, he encouraged Connecting Council members to discuss portions of the Lewis Center report at their tables. Some of the analysis focused on the conference’s extremes of urban populations in relatively close proximity to one another contrasted with large rural areas with low concentrations of people – a fact that most people in Kansas and Nebraska recognize but for which the study provided context related to ministry opportunities and concerns. The Rev. Cindy Karges, superintendent for the Gateway and Great West districts, said the report's analysis about the growth in the number of small churches, and the impact that has for deploying effective clergy, stood out to her. "Working to provide affordable pastoral leadership to an increasing number of particularly smaller churches does put a stress on the system," Karges said. "Tied to this is the observation made regarding the number of pastors other than elders who serve the very small churches and the question of do we have systems to access and support these pastoral leaders sufficiently." Karges said she was hopeful that the conference's move to networks, with a team of clergy and laity working together across churches to share best practices and to provide resources and support, will allow the Great Plains to think creatively about how churches are served and how to support all pastoral leaders. Geist pointed out that the conference has opportunities to expand the Wesleyan witness within the Great Plains Conference boundaries and beyond. She said now is the time to focus on the positives instead of dwelling on negatives. “We have lots of life, enthusiasm and love to share,” she said. city. He said the signing of a lease is imminent, which could allow for the current Topeka-based administrative services staff to begin moving into the new location by Dec. 1. The office, located at 1207 SW Executive Drive, just south of the junction of Interstates 70 and 470 in west Topeka, would be leased for approximately five years in part of a large, modern building owned by Bartlett & West, an engineering firm. Hamrick explained the lease allows for the conference to achieve its goal of centralizing staff members to foster improved communication and would allow the conference to determine how much space it needs long term, as well as how that space would be used, after the upcoming 2019 special session of General Conference to address rules associated with human sexuality spelled out in the Book of Discipline. Hamrick also reported that Patrick McKaig would remain on conference staff in the new role of property coordinator. The Rev. Craig Hauschild, chair of the Personnel Committee, updated the council on how conference staff is being scheduled for the move to Topeka. He said last summer, all current lay staff members were offered a position in the new Topeka office, though it is known that some people do not intend to move to the new location, and some people may serve in slightly different ways than they do now. A two-day introduction to Topeka, with expenses paid for by the conference, is being set up for later this fall so people who work and live in the Wichita and Lincoln areas can become more acquainted with the new home base for the Great Plains. A deadline of Dec. 1 has been set for staff members to notify supervisors if they intend to make the move to Topeka. Clergy staff members will work within the appointive process, just as they have each year in the past. “Our intention is for all staff members to be in place in Topeka by July 1, 2018,” Hauschild said. Hauschild said the conference has assembled a severance package for employees who choose not to move. The package consists of two weeks of pay for every year served, with a cap of six months of pay; six months of health insurance; counseling services free of charge for employees and their immediate family members; and coaching and out-placement services to help them find new employment opportunities. Hauschild concluded his presentation by addressing the hiring process for an executive director, a position that will serve as a chief operating officer for the conference. He said a nationwide search resulted in about 15 applicants. The Personnel Committee hopes to have a decision within the next several weeks, with the person starting as soon as Dec. 1. That person is expected to be based from the start in Topeka. Bishop Saenz led a brief discussion about the conference’s efforts to provide cleaning kits to people impacted by hurricanes that hit the United States mainland and the territory of Puerto Rico. He explained that he set a goal for the conference to compile 5,000 flood buckets, or just slightly fewer than 300 from each of the 17 Great Plains districts. Bishop Saenz said the effort served as a good example of a book summary the council read from authors Ori Brafman and Rod A. Beckstrom titled “The Starfish and the Spider.” In the book, the authors describe the difference between organizations based on characteristics of spiders, which have a rigid, top-down hierarchy, and starfish, which rely on the power of peer relationships and autonomy. “I didn’t think about logistics, or how all of this stuff was going to be stored or organized,” Bishop Saenz said. Connecting Council members shared brief stories about how the effort achieved the goal: Hardware stores donated buckets. Churches provided supplies to fill out incomplete buckets. Kids packed buckets as part of children’s sermons. Small churches partnered with nearby schools to gather and load supplies. One church – in Aurora, Nebraska – served as a hub so churches from farther away population centers could deliver completed cleaning kits without having to drive all the way to one of the conference offices. The Rev. Hollie Tapley, disaster response coordinator, reported that more than 6,340 cleaning kits/flood buckets had been assembled and delivered to areas in need of those supplies. She also reported that more than $553,209.75 had been collected by local churches for the United Methodist Committee on Relief (UMCOR) for assistance in the impacted areas. Additional funds were donated directly to UMCOR. Bishop Saenz said the conference's accomplishment shows what can be accomplished when a clear goal is set and people are given leeway on how to accomplish the goal, similar to the starfish in the book example. Tapley said the conference has 205 active, trained, certified disaster response volunteers and that there is a group of approximately 25 people who repeatedly answer calls for assistance. That group has donated about 10,040 hours of service over the past 18 months, with more than 7,700 of those hours coming during the response to damaging floods in Mulvane, Kansas. Via a video, the Rev. Nancy Lambert, director of clergy excellence, and the Rev. Ashlee Alley Crawford, coordinator of clergy recruitment and development, presented a proposal to bolster leadership skills among clergy. The proposal was developed in correlation to the clergy excellence team’s 2015 strategic plan. Crawford said the plan will require a three-year rollout phase including three program elements: clergy covenant groups, a self-directed learning plan and continuing education opportunities. In coordination with the Board of Ordained Ministry and the Cabinet, Lambert and Crawford asked the Connecting Council to request use of reserve funds from the Council on Finance and Administration (CFA) to fund the rollout phase of the program, which calls for $60,500 in 2018, then $149,000 in 2019 and $154,000 in 2020. After 2020, the money would come from the conference’s expense budget. An amendment on the proposal was approved by the council that calls for part of the rollout phase to be paid for from the conference budget in a graduated scale each of the next three years. Concerns centered on the potential problem of the budget absorbing such a large dollar figure all at once in 2020, especially in a year following the special General Conference convened to discuss issues surrounding human sexuality. The Connecting Council approved the revised proposal without dissent. The proposal now goes to CFA for consideration. Heard a report from the Rev. Tessa Zehring, chair of the Nominations Committee. She shared a new page under development for the conference website that eventually will serve as a database of spiritual gifts, skills and hobbies that will help local churches recruit assistance when needed from their own churches, their districts or even from the conference. Took part in a discussion about legislation passed during the 2017 annual conference session in Grand Island, Nebraska. The discussion was led by Dirk Hutchinson, an at-large member of the Connecting Council and member of Salina Trinity UMC. Received an update from Courtney Fowler, conference lay leader. She reported that she and her family relocated over the summer to Virginia because of her husband’s employment. As a result, she has stepped down as leader of the Great Plains Conference delegation to General Conference, but she intends to complete her term as lay leader, in part because of responsibilities she has taken on as vice-president of the Association of Annual Conference Lay Leaders. Her responsibilities, including committee assignments, have been reassigned to associate conference lay leaders to ensure the laity is represented effectively. Approved moving the Great Plains Conference Resource Center from the current Lincoln office to the new conference office in Topeka, once that building is ready to house the materials. The center distributes more than 850 items annually to more than 170 churches, including some outside the denomination. The Bible studies, videos and Bible school materials are checked out with a modest fee that helps cover shipping costs. Lona Dearmont, from the Archives and History Team, reported the recommendation from the Resource Center Board of Directors. The report noted that the Resource Center’s mission fits with the conference’s overall vision for resourcing and supporting local churches by providing much-needed materials. The vote, which came without dissent, means the center and the staff person assigned to it, will be based in Topeka. Heard a report on the conference efforts for a week of prayer related to the Council of Bishops’ Commission on a Way Forward. It is estimated that more than 500 people took part in the prayer vigil that aimed to have at least one person dedicated to prayer for the denomination each hour for seven days. In total, the conference filled 142 of 168 time slots for the week of Sept. 3-9. Heard a report on finances from Scott Brewer, conference treasurer and director of administrative services. He stated that income at this point in 2017 is largely unchanged from the same time frame in 2016. His presentation focused on how the conference intends to prepare budgets for its departments and committees going forward. The Program Logic Model, he said, helps identify priorities and set goals for outcomes and impacts on ministry areas. Adjustments then can be made to spending plans as circumstances dictate. Approved a resolution to establish the Great Plains Conference Committee on Native American Ministries. The Rev. Mark Crist, pastor at First UMC in Wahoo, Nebraska, provided a presentation explaining the necessity for the committee based on Book of Discipline paragraph 654. He said the goal is to nurture relationships with native peoples, provide learning opportunities, advocacy and to offer Christ in the Wesleyan tradition. Among possible functions, Crist cited confronting poverty, addressing human trafficking, addressing racism, encouraging economic development and helping achieve healthy lifestyles. Approved a recommendation from the annual conference session planning team to change the dates and venue for the 2019 annual conference session. The change means the 2019 session now will be May 28-June 1 in Topeka. The move was made because the previous venue, the Pinnacle Bank Arena in Lincoln, didn’t have space for workshops, an addition to annual conference in 2017 that proved to be popular with people who answered post-conference surveys.